Sunday mornings should be special occasions, don’t you think? A simple celebration of nothing-in-particular with your loved ones to start off the day, marked by a sweet, delicious meal together. On other days, breakfast tends to get brushed off. My husband and I usually make a blender full of green smoothie, a giant cup of which I put in his hand just before he pulls out of the driveway for work, and then I sip mine while I’m checking work e-mails. One day a week, why not be different? This recipe is my go-to Sunday specialty. This happens to be a timely post, as fresh blueberries are still in season. My next several posts will focus on some of the many amazing summer fruits that are available this time of year. I hope you enjoy these healthy pancakes. Place the rolled oats in a small bowl and add 1 c. almond milk (you can substitute another kind of milk if you have a preference, but I recommend choosing plain milk, as opposed to vanilla flavored). Add the cider vinegar and stir. Allow to stand while you prepare the rest of the ingredients, so that the oats have time to absorb the liquid and soften. In the meantime, grind the flax seeds. I use the Magic Bullet with the flat blade for this task. It’s better to grind the flax seed yourself rather than buying “flax seed meal,” because the seeds begin to lose their nutritional value over time after they are ground (refrigeration slows, but does not stop this process), but if you don’t have a tool for grinding them, flax seed meal will work, of course. Once the seeds are ground, add the water and stir with a fork. Allow this mixture to stand and congeal a bit, while you mix the dry ingredients. 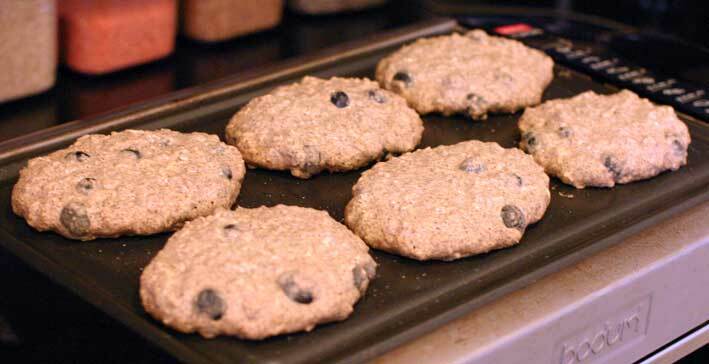 In a large bowl, sift together the buckwheat and whole wheat flours, cinnamon, baking powder and baking soda. I recommend sprouted whole wheat flour if you can find it, or if you’re avoiding gluten, use twice the buckwheat flour and skip the whole wheat. 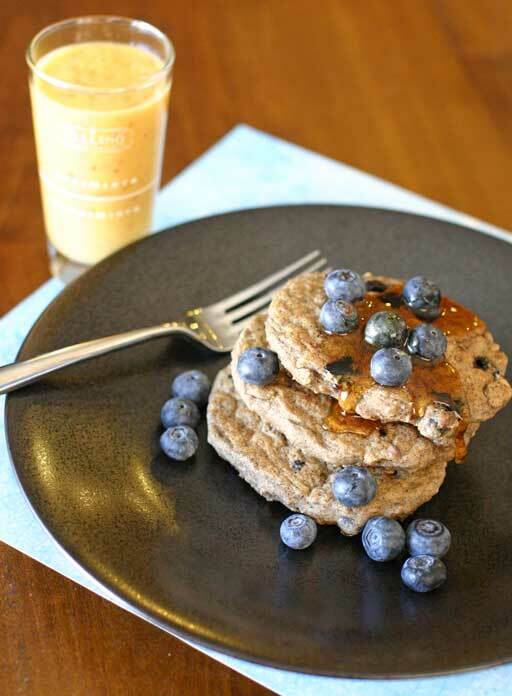 Using all buckwheat changes the consistency of the pancakes slightly, but they’re still yummy. Return to the flax seed mixture and add the coconut milk, mixing again with a fork to combine. Heat your griddle to a medium-low temperature and lightly brush some coconut oil over the surface to grease it. Make a well in your dry ingredients, and pour in the oatmeal and flax mixtures. Stir well, and add up to an additional 1/4 c. of milk if the batter seems too dry. I use the full additional quantity in mine because my ingredients tend to be very dry in our arid climate. Fold in your blueberries. Drop the batter onto the griddle in 4-inch puddles and cook 6-8 minutes on each side. Keep an eye on them, though, because everyone will be cooking at a different temperature, so yours might cook faster than mine. Flip them when the tops start to look dry and the bottoms begin to turn a crusty golden brown. After you’ve cooked both sides, they are ready to serve! 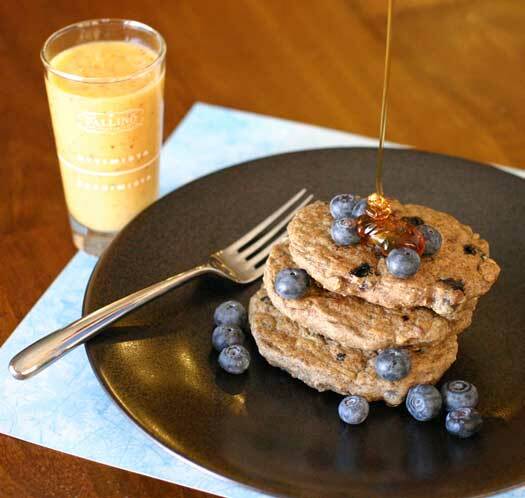 Top with your favorite syrup (maple or agave, or bee-free honey) and more fresh blueberries. This recipe makes about nine 4-inch pancakes. They are more filling than traditional pancakes, so I would say that this amount serves three people with modest appetites. It can easily be doubled to serve more, and if you make too many, the cooked pancakes keep nicely in a baggie in the fridge. Reheat in the toaster oven or eat cold. I like to serve these with a little homemade juice. Toss one peeled orange, half a peach – with its skin still on if its organic – (or a slice of fresh pineapple, including the core) and half a large banana into a high-speed blender. Add a cup of crushed ice and blend until smooth. You can use frozen fruit, too, but if you do, reduce the amount of ice accordingly. Buckwheat (not a cereal grain but a fruit seed) is a good source of protein because it contains all eight essential amino acids, as well as dietary fiber and minerals such as magnesium, manganese and copper. It also contains the bioflavonoid rutin, which is helpful to the circulatory system. In addition to providing the omega-3 and omega -6 fatty acids that tend to be more elusive for vegans, oats are high in protein, and are a good source of manganese, phosphorus and selenium. Whole wheat flour is more easily digested than refined grain flours such as all-purpose flour. When sprouted (the whole wheat berries are soaked and allowed to sprout, then dried and ground into a flour), the vitamins and minerals exist in greater quantities and are more easily absorbed by the body. The sprouting process also makes the flour low-glycemic, as the body metabolizes the food more like a vegetable than a starch, keeping blood sugar levels more even over time. Flax seed must be ground in order to be digestible. Otherwise, the seeds pass through the digestive system without imparting their many benefits. Flax seed is high in protein, fiber and lignans, and also provides those important omega-3 and omega-6 fatty acids. Especially rich in the vitamins thiamin, folate and B6 as well as a handful of minerals, flax seed also reduces inflammation in the body and is a good source of cancer-deterring antioxidants. Blueberries are a good source of Vitamin C and K, but they are famous for being a “superfood,” full of phytonutrients that act as antioxidants, reducing the effects of oxidative stress on the whole body (anti-cancer, anti-inflammatory, cardiovascular and circulatory benefits, muscle repair, and reportedly even memory boosting benefits). 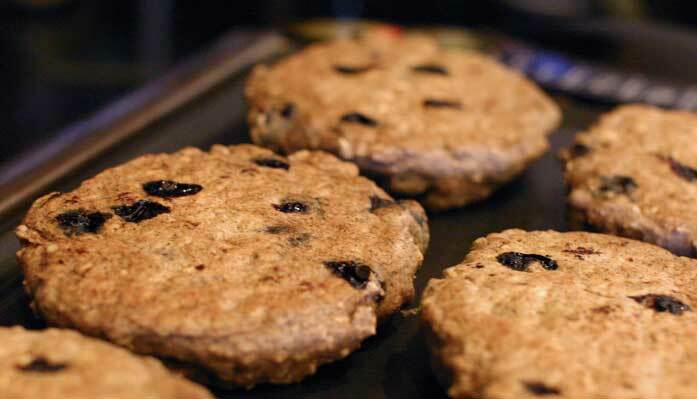 7 Responses to "Oatmeal Buckwheat Blueberry Pancakes"
I have all but the Buckwheat Flour…may have to buy some and give these a try! That’s great, Amie. Let us know how they turn out for you! 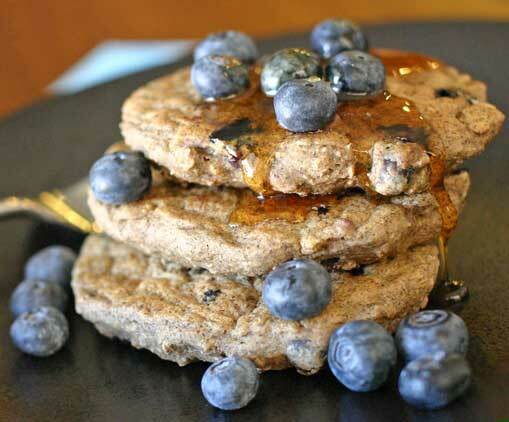 These look really yummy- and I’ve been looking for more ways to use blueberries! These look so yummy! I forgot about using the buckwheat I bought. I don’t usually have coconut milk on hand. Can you give some tips on how to buy it? Hi Aunt Janet! You should be able to find coconut milk in most large supermarkets in the Asian/Ethnic Foods aisle. I believe the most common brand is “Thai Kitchen” in a red can (they have an organic version, too). I buy the store brand at WholeFoods Market, but if you don’t have a WholeFoods or other health food store near you, you can also get it on line at Vitacost. Vitacost offers free shipping on orders over $49, so if you’re inclined to buy more items at once, it can be a pretty good deal. I wouldn’t pay much more than $2 a can for coconut milk, just as a reference. One last note: A less healthy but still viable substitute for coconut milk in this recipe is a neutral flavored oil. Hey thanks so much for your help. I was kind of afraid you were going to tell me to climb a coconut tree. Haha. The web site sounds like a winner. I will check it out. Thanks.